The Vegreville Iron Runners Auto Club meets at 6:30 PM for coffee, with the meeting at 7:00 PM, on the first Wednesday of each month, except in January and August, at the Club House (Vegreville Regional Museum). Vehicle ownership is not a requirement for membership. Our meetings are open to both Husbands and Wives. Membership Dues must be paid at our December Meeting. Finally, vehicle storage space is available at the Regional Museum, on a first come basis, providing a donation of $100 per vehicle is made to the Historical Society. Spring is around the corner. February has proved to be a fairly warm month with a limited amount of moisture. The warm weather has made many of us yearn for an early Spring. I sincerely hope March is not the brutal month that it has been known to be. Meanwhile, most of us are happy with the mild weather we have been having so far, as well as not having to shovel too much of the white stuff. As well, any of our club members will be sporting new jackets and shirts this year, thanks to Moto Apparels and Angela Wakaruk, out of Lloydminster. On behalf of myself and my wife, Sylvia, I would like to wish everyone a very Happy Easter and a most enjoyable Spring. Welcome to another edition of “The Wheel Spin”. Soon Spring will be upon us, but first we will have to get through March, which can be very cold and nasty. Once April arrives, the swap season and show and shine season will be upon us, and we will have to take our cars out of storage and get them ready for this year’s events. Our web site is http://vegironrunners.ca. Scott Manson is our new web master and he would appreciate receiving photos and articles to put on it. This Is your Bulletin; It is only as good as the effort you, the members, are willing to put Into it. The drop off point for your contributions, suggestions and comments is my residence at 5701 – 43 A Street or you may also e-mail me at sawss@telusplanet.net. submit articles for future issues. Your submissions are greatly appreciated. Opinions expressed, in “The Wheel Spin” are those of the authors and. do not necessarily represent the views of the Vegreville Iron Runners Auto Club or its members. “The Wheel Spin” takes no responsibility for the accuracy of copied ads. Other Clubs are welcome to use published materials, except where prohibited by the author/s. SVAA has its own web site. Work on a history of the Iron Runners that was begun by Sylvester Komick and Orest Lazarowich is continuing under the leadership of Orest Lazarowich. Your utmost attention and assistance in completing this project would be most appreciated. This is only one of the legacies left to our club by the late Sylvester Komick. We still need all Past-Presidents to please submit a review of their year or years as President and to go through their files and turn over all materials they think would be appropriate for inclusion in our Archives. Your support and cooperation is greatly appreciated. The Vegreville and District Special Interest Motor Vehicle Club came into existence on the second day of October, 1989. The Iron Runners Auto Club name was officially accepted at the November, 1989, meeting and the first twenty five members were designated as charter members. The first annual meeting was held in September, 1990. The club is now known locally as the Vegreville Iron Runners Auto Club. The original Charter Members who are members of the Club, at this time include: Denise Komick, Orest Lazarowich, and Jerry Wilde. On a motion passed at the May 2nd, 2001, regular meeting of the Vegreville Iron Runners Auto Club, It was agreed that the Club would recognize individual members who have maintained continuous membership In the Club. A Club Builder’s Award will be presented to members who have achieved or demonstrated continuous contribution and support to the Vegreville Iron Runners Auto Club locally and provincially. This recognition will be in the form of a plaque presented at the annual meetings to Individual members who are in the 5th, 10th, 15th, 20th, etc. year of continuous membership. This will be determined by the membership records kept by the Treasurer. The plaque will list the member’s name and the length of term of membership. May you have a great Easter and Spring!!! The “Vegreville Iron Runners Auto Club” has continued its spirit of involvement with the community. The “Vegreville Iron Runners” provide financial support for the Canada Day celebrations hosted by the Knights of Columbus. As well, “The Vegreville Iron Runners” have instituted a scholarship at the high schools, in Vegreville, called the “Vegreville Iron Runners Memorial Scholarship “. It is awarded annually to a student who is registered in a post-secondary automotive program. The Iron Runners are also continuing their support of the Regional Museum. Many of our club members travelled to Bruce on Saturday, December 17th, for a steak and shrimp supper. 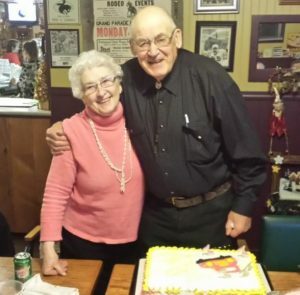 At the same time, we helped George Sample celebrate his 84th Birthday with cake and song. Other birthdays were also noted, but for the life of me, my photographic memory has run out of film, and I can’t remember who they were (A sign of my aging). Along portions of Stanstead, Québec’s Canusa Street, houses on the southern end lie entirely within Vermont, while their driveways direct northward and connect to the street in Quebec. Their backyard neighbors are American, while families living across the street are Canadian. In other areas, the international border runs right through individual homes, so that meals prepared in one country are eaten in the other. Henry Seth Taylor, the builder of Canada’s first automobile, lived and worked here. At age 11, Taylor left home to learn new skills. He dreamed of becoming a watchmaker and thus set off for Boston, some 225 miles away… on foot! In the early 1860s, already married and with children, he returned home to Stanstead to open his own business. Running his successful jewelry store by day, he spent evenings inventing, experimenting and building things. One of his projects was a self-propelled vehicle, which took Taylor a few years to get on the road. Alas for Taylor, that first showing of torque fizzled out when a steam hose burst, enveloping the car and driver in a worrisome vapor cloud. Still, his car was only a few months younger than Canada itself, which had been formed on July 1, 1867. Undaunted, he soon got things back on track, and by the next year’s fair, his baby performed flawlessly. The car was unseen for nearly a century, re-emerging when the Taylor property was sold to Gertrude Sowden of Stanstead, who, fortunately, recognized the importance of the steam carriage in the garage. When no museum showed interest, the remaining parts were bought by Richard Stewart, president of Anaconda American Brass and moved to Middlebury, Conn. 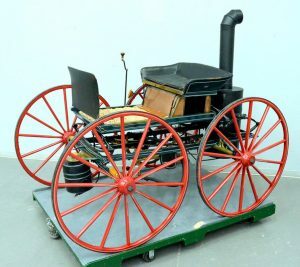 Using the only photograph known of the carriage, Stewart had it completely rebuilt and, in 1969, showed it at the Ontario Science Center in Toronto. Since 1983, the Seth Taylor car has sat proudly in the national collection of the Canada Science and Technology Museum in Ottawa, which is preparing its re-opening for Canada’s 150th anniversary this fall. Thanks to Taylor and other local founding gearheads, the Québec’s Eastern Townships can be considered the cradle of the Canadian automobile. In addition to the Seth Taylor Steamer, the region also produced the country’s first gasoline car. It was George Foote Foss’s 1897 Fossmobile, which used a single-cylinder, four-horsepower engine to reach 15mph and was said to have climbed the most challenging of hills. Then, there was the original Thibault fire truck company, rooted locally in humble family beginnings. And of course there’s another engineering giant, Joseph-Armand Bombardier and his vision of dashing through the snow. Pioneers, all, but Taylor was the one who succeeded first. Many thought he was a fool. Others wanted him arrested, thrown in jail, even. “A bulky, useless toy,” some said, suggesting that his steam-spurting contraption was nothing short of the devil’s work. The man never sought fame nor fortune. He was just a hobbyist doing his thing, often in the face of public mockery. Were it not for the tranquil passion, steadfast resolve and mechanical genius of this enterprising watchmaker, one can only wonder where the story of a dual birthday – Canada’s and the Taylor steam car, both turning 150 – would have gone. On December 10, 1936, a mysterious black limousine pulled up at No. 10 Downing Street in London, the official residence of British Prime Minister Stanley Baldwin. A man exited the limousine and entered No. 10 for a short meeting. After the gathering, the man left in the dark car with blinds drawn in the rear passenger compartment. What was this car, so unusual for its time and place? And who was that man? The man, who turned out to be the owner of the car, was King Edward VIII. And the car? It was a one-of-a-kind limousine ordered from the London showrooms of Lendrum & Hartman to the King’s personal specifications. Its custom body was Canadian, designed and built by the McLaughlin Motor Car Company of Oshawa, Ont. It rode on a stretched 1936 Buick Series 90 chassis, supplied by General Motors of Canada, and was powered by a 5.2-liter Buick straight-eight engine. The car has been variously described as a McLaughlin, a McLaughlin-Buick and simply as a Buick (which, technically speaking, it is not). What, then, is a McLaughlin? Canadians know it well, as does the English royal family, which has admired and owned them, off and on, for more than 90 years. The sumptuous custom models became known as the Royal McLaughlins. McLaughlin’s story began in 1869 when the company founder, Robert McLaughlin, built his first carriages. His company would become one of the world’s largest carriage-makers before switching to automobiles in 1907. In a stock swap, McLaughlin contracted with William C. Durant, General Motors’ founder, to be supplied with Buick engines and chassis to power McLaughlin automobiles. In 1915, McLaughlin started manufacturing Chevrolets in Canada, and by 1918, it formed the basis for General Motors of Canada. In 1923, the McLaughlin vehicle became the McLaughlin-Buick; it would continue building vehicles under that name until 1942, when the McLaughlin name was dropped and only Buick remained. The McLaughlin’s royal connection actually began in 1924, when the Prince of Wales – Edward VIII’s title as a youth – ordered nine McLaughlins for a royal tour of Canada. It was said to be the first time the royal family had used anything other than British automobiles. McLaughlins were again used for a 1927 royal tour of Canada. A daughter of Queen Victoria ordered one in 1934. The Prince of Wales ordered his soon-to-be-famous limousine in 1935, and it was delivered to him shortly before he became king. He ordered at least two more while living in France in 1938 and 1939. Even Mrs. Simpson had one of her own – a gift from her third husband, Ernest, whom she divorced for Edward. Edward’s brother, who would become King George VI, ordered McLaughlin to build two special phaetons for his Royal Tour of Canada in 1939. And, in fact, one of these vehicles was still in service in 1986, when it carried Prince Charles and Princess Diana on their tour of Canada. 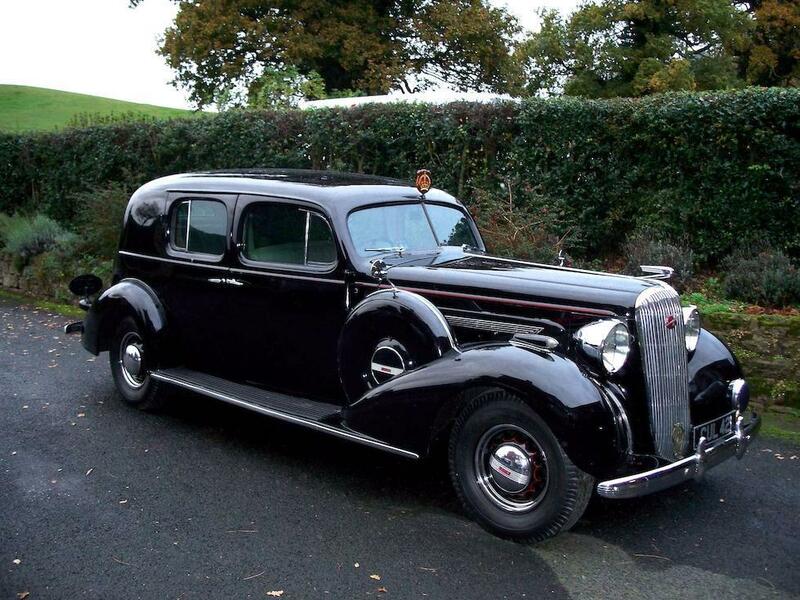 Although prewar McLaughlins are scarce, and sometimes misidentified as merely Buicks, the McLaughlin name still has cachet among discerning collectors. In fact, the so-called “Most Romantic Car in the World” still exists; it changed hands in 2007, when it was sold at a Bonhams auction for £100,500 (about $124,000). Mrs. Simpson’s similar car was sold to another collector the same year. Accompanying documents included the original logbook stating the first owner to be H M The King, St. James’s Palace, SW1. that history are maintained and can be viewed at the OPP Museum in Orillia, Ont. Prior to the 1940s, officers rode their own motorcycles, which they also maintained, to perform their patrol duties on Ontario highways. The OPP Museum’s 1931 Henderson Streamline Special KL, equipped with red lights and police identification on the front fender, was typical of equipment used by an OPP motorcycle officer. A retired OPP motorcycle patrolman from Perth, Ont., located it in the 1970s and rode it until his 80th birthday in 1990. His family donated it to the museum, where it’s the oldest original OPP vehicle in the collection. 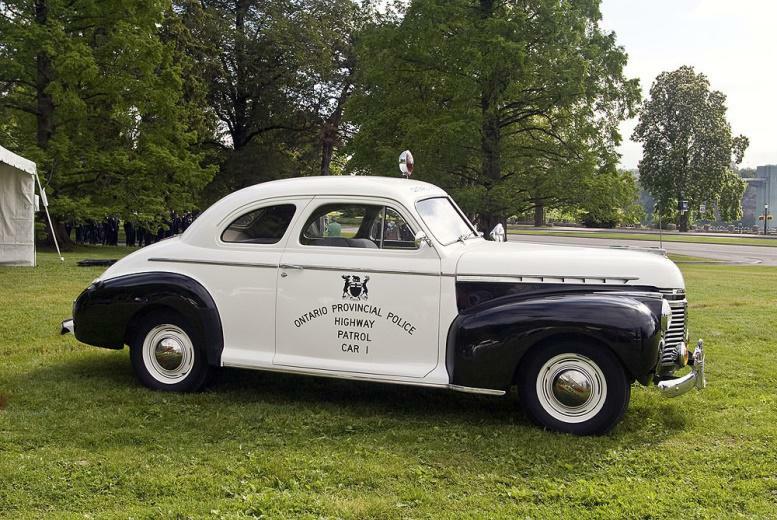 A 1941 Chevrolet Master Deluxe Coupe in the museum’s collection is representative of OPP cars that served through most of the 1940s. Since civilian auto production stopped in North America soon after the Japanese attack on Pearl Harbor, Hawaii, thrust the United States into WWII, these Chevrolets served years longer than patrol cars normally would – into the late ‘40s. As mentioned above, the purchase of this Chevrolet marked the OPP’s transition to patrolling with cars rather than motorcycles. This particular car was lovingly restored in the early 1970s, and it has competed in a distance race from Ottawa to Mexico City, with two officers dressed in period OPP uniforms. The 1950s and early ‘60s saw a mix of Mopar and Chevys in the OPP fleet. Chevrolet coupes from 1953, along with 1955 Plymouth Savoy four-doors, were among the most common. Burbidge started two-door Dodges from the early ‘60s dominated. A steady stream of Dodge Diplomats, Plymouth Gran Furys and Ford Crown Victorias followed. While rear-wheel drive was favored for its simplicity (the OPP made it through winters with snow tires at each corner and a trunk full of heavy police radios and other essential gear), the arrival of the front-drive Ford Taurus in the 1980s was welcome. The enhanced traction was put to good use, and many of the OPP’s Taurus sedans had the Yamaha-engineered 24-valve SHO engine that made more than 200 horsepower. When those cars were retired, the fleet reverted to Chevrolet Caprices and Ford Crown Vics for the most part, and examples of each are kept at the OPP Museum. Burbidge did have a soft spot for one particular OPP car, a 1968 Plymouth Fury I two-door. He bought it with about 120,000 miles on the odo when it was retired; it ran another 200,000 miles before he donated it to a high school body shop. Then it served another five years as a postmaster’s car in rural Ontario, a testament to the car’s durability and its care under Burbidge and the OPP. I just read that 4,153,237 people got married last year — hmmmm, not to cause any trouble, but shouldn’t that be an even number? I find it ironic that the colors red, white, and blue stand for freedom, until they are flashing behind you. America is a country which produces citizens who will cross the ocean to fight for democracy but won’t cross the street to vote. You know that tingly little feeling you get when you like someone? That’s your common sense leaving your body. A couple of women moved in across the hall from me. One is a middle-aged gym teacher and the other is a social worker in her mid-twenties. These two women go everywhere together, and I’ve never seen a man go into or leave their apartment. Do you think they could be Lebanese? I joined the Navy to see the world. I’ve seen it. Now how do I get out? Remember, these people can vote…..
Brown the ground beef and drain the excess fat. Add the first five ingredients and simmer for a few minutes, while stirring occasionally. Cook noodles as directed on package. Cook until almost done.) Drain and rinse under cold water. Set aside. Combine Cottage Cheese, Eggs, and Salt and Pepper. Add to mixture in sauce pan. Let simmer while preparing baking pan. Butter (grease) a 13 inch by 9 inch baking pan. Repeat procedure with remainder of ingredients. Bake for ½ hour at 375 Degrees F.
Let stand for about 15 minutes before serving. The SVAA was created back in the 1970’s by a group of members of several Alberta vintage vehicle clubs for the original purpose of correlating event dates to avoid conflict This grew Into a lobby group which over the years was able to bring antique (one-time) licensing for vintage cars (25 years and older) to Alberta, and recently was able to petition, with the National Association, the Federal Government in order to prevent the creation of pollution or junker laws with respect to old cars. Today, the SVAA consists of 47 Alberta Vintage, Modified, Street Rod and 4-wheel clubs in Alberta, representing over 1,500 individual persons. The Association is dedicated to the preservation, restoration, and enjoyment of all antique, collector, vintage and specialty vehicles. Also, the Society Is dedicated to bringing all auto related clubs in Alberta together, to promote and protect our common interest in theAutomobile Hobby. Be sure to check your local listings, for location & times, for more Information, check out www.cruisin@aw.ca For great burger specials every month from A&W to all Classic Car and Hot Rod Cruisers, contact: cruisin@aw.ca., and they will send you some coupons. The SVAA publishes events throughout the year, so please forward your information to al@svaalberta.com or by mail. Some events are now included on the SVAA web site at www.svaalberta.com. Do not send events to this web site. The undersigned hereby agree to Indemnify all officers and directors against any and all alleged wrongful acts, wrongful acts and/or claims resulting from attendance and participation In this tour and associated events. I/we certify the vehicle indicated above is properly and adequately Insured, licensed, registered and is in a safe operating condition. Just wanted to say that though this page hasn’t had many updates in the past, but I’m going to try my best to keep it up to date from now on.